Deep Brain Stimulation or DBS is the most common operation for PD performed at Vancouver General Hospital. The information below is reprinted with permission from an article we published in US Neurology (2012) entitled Deep Brain Stimulation for Parkinson’s Disease – A Review. Before the introduction of DBS, neurosurgeons could only destroy the overactive brain regions responsible for movement disorders. These operations (see thalamotomy and pallidotomy) are still performed by heating the tip of an electrode and coagulating a very small area of the brain. Deep brain stimulation is designed to “turn off” these overactive brain regions without destroying them. How DBS works is still debated–the original suggestion was that the neurons around the tip of the electrode were blocked from working, others suggested different neurons were activated and more recently some have suggested that the abnormal rhythms of the PD brain are jammed. Regardless of how DBS works, the immediate advantage of DBS over destructive neurosurgery is that the DBS can be adjusted after surgery to best match an individual patient’s symptoms and can always be turned down if side effects are caused. The DBS ‘lesions’ are therefore titratable and hence reversible. The benefit of DBS surgery depends on where the electrode is placed. Thalamic DBS helps tremor, pallidal DBS helps dyskinesia and subthalamic nucleus DBS helps motor fluctuations. Each operation is detailed below. The major risks of DBS surgery are the same regardless of the target. Approximately 1% of patients will have a stroke that can be potentially devastating or lethal. Approximately 5% of patients will develop an infection. Infections can be treated with antibiotics but occasionally it means removing the DBS device until the infection has cleared and repeating the operation with a new device. When the DBS is turned on after surgery, there can be some stimulation induced side effects. These are always reversible (just turn the stimulation down) but approximately 4% of our STN DBS patients develop stimulation induced behavioural changes that can be very upsetting for their family if not warned. These patients can become hypomanic – saying and doing very inappropriate things. We now only perform this surgery in patients who have reliable supporters (family or friends) who will immediately notify us if the patient is behaving inappropriately. The patient themselves may not notice the changes – or worse, they may enjoy them. 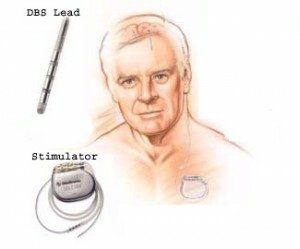 The first company to successfully market the deep brain stimulators was Medtronic and they have an extensive website with many pages for patient education. There are three components to the DBS system (see diagram to the right). The first is the DBS lead. The tip of this insulated lead has four platinum/iridium electrodes spaced usually 0.5 mm apart. These electrodes are placed within the target brain region and are used to deliver the high frequency stimulation designed to block or disrupt the function of the surrounding brain. An insulated cable, the Extension, is tunneled subcutaneously from the DBS lead to its power source. The implantable neural stimulator (INS) is usually placed in a subcutaneous pocket below the collar bone and provides both the power for stimulation and the ability to use telemetry to control the stimulation parameters. The final size of the ‘lesion’ is adjusted in the outpatient clinic after surgery by changing these stimulation parameters. The DBS effects can then be tailored to the individual’s symptoms: enlarging the ‘lesion’ to increase beneficial effects or reducing its size to avoid a side-effect. There are two parts to any DBS operation: implantation of the DBS lead within the brain and insertion of the INS. The details of implantation are beyond the scope of this review but any neurosurgical center with stereotactic experience and appropriate training can perform the operation. Patients should ask their neurosurgeon how many procedures they have done and what their complication rate is. Think about having the procedure done somewhere else if the neurosurgeon has performed less than 30 of that specific operation or has a serious complication rate (stroke or death) over 1%. At the University of British Columbia, we typically use a MRI compatible head frame (UCLF, Radionics). Frames are placed using local anesthetic and some sedation may be given especially if the patient has tremor. Patients receive pre-operative antibiotics on transfer to the O.R. The hair is shaved over the coronal suture and the scalp prepared, draped and infiltrated with local anesthetic. A 14 mm burr hole is drilled in the skull and the dura opened. The arc system is then attached to the head ring. The brain target area can be localized with either macrostimulation or microelectrode recording. Once the probe has found the target area, it is replaced by the DBS lead under fluoroscopic guidance. The lead is locked in place with a burr hole button and the scalp temporarily closed. For the last ten years, this portion of the procedure has been performed immediately after implantation of the DBS lead. During insertion of the INS, patients receive a general anesthetic and are asleep the whole time. The Extension is tunneled under the skin from the scalp to the chest. The Extension is then connected to the DBS lead in the scalp and the INS in the chest. The effect of DBS depends on where the electrodes are placed. There are three common target sites for the control of Parkinson’s disease symptoms: the thalamus, the pallidum, and the subthalamic nucleus. Each target site has different indications, effects and potential complications. One of our patients kindly agreed to share his story on YouTube. Please click “Ray’s Story” to watch his story. Thalamic DBS will reduce tremor regardless of the cause. The most common cause of tremor requiring surgery in British Columbia is a condition called Essential Tremor. Parkinsonian tremor is also common but other causes such as Multiple Sclerosis (MS), stroke or trauma have also been treated at our institution. We have published our results for the treatment of tremor in patients with MS (see our Research page). Benabid was the first to treat Parkinsonian patients with drug resistant tremor using DBS in the thalamus. This procedure has become widely accepted and received FDA approval for the DBS technology August 4, 1997. Retrospective series have shown that DBS is as effective as thalamotomy in tremor control and has less potential complications. Bilateral thalamotomies are well recognized to carry additional risks to cognitive functioning, memory, language, swallowing and speech. Bilateral thalamic DBS can reduce these risks. A multicenter study showed that thalamic DBS may reduce tremor up to 85% at one year follow-up. Both upper and lower limb tremors can be reduced with improvements in the activities of daily living scores. We have published our results of bilateral thalamic DBS for head tremor (see our Research page). The benefit of thalamic DBS is an approximately 80% reduction in tremor in the opposite side of the both. A bilateral procedure (electrodes in the right and left thalamus) will reduce tremor on both sides of the body. The risks are the same for any DBS procedure (approximately 1% chance of a devastating stroke or death and a 5% chance of infection). The stimulation is typically adjusted very quickly in the DBS Clinic with few visits required. Too much stimulation usually causes difficulty speaking or tightness/tingling in the opposite arm. Battery power usually lasts more than four years (sometimes up to seven years). The globus pallidus internus (GPi) is the target of choice for symptoms of Parkinsonian dyskinesia. We also use this target for patients with dystonia. Pallidotomy (making a permanent lesion within the pallidum) for Parkinson’s disease became very popular again after 1992. This operation dramatically improves contralateral dyskinesia and, to a lesser extent, bradykinesia, tremor, and pain. As the disease progresses, however, the other side of the body is often affected. Most, but not all, neurosurgeons were reluctant to perform the contralateral pallidotomy because of the increased morbidity seen following bilateral thalamotomies. Pallidal DBS provided a solution. Similar to the pallidotomy, the most dramatic effect of pallidal DBS is reduction in contralateral dyskinesia. The benefit of pallidal DBS for Parkinson’s disease is an approximate 90% reduction in dyskinesia in the opposite side of the body. Patients continue to take their PD medications to help with the bradykinesia but the side effect of their medications (dyskinesia) will be blocked by the surgery. This means they may be able to take even more medications if necessary. A bilateral procedure (electrodes in the right and left thalamus) will reduce dyskinesia on both sides of the body. The risks are the same for any DBS procedure (approximately 1% chance of a devastating stroke or death and a 5% chance of infection). The stimulation is typically adjusted very quickly in the DBS Clinic with few visits required. Too much stimulation usually causes difficulty speaking or tightness/tingling in the opposite arm. Battery power usually lasts more than two years (sometimes up to five years). Subthalamic nucleus (STN) deep brain stimulation (DBS) is the most common neurosurgical procedure for Parkinson’s disease at Vancouver General Hospital. The STN is the target of choice for ‘motor fluctuation’ of Parkinson’s disease. The pathological over-activity of the STN in the Parkinsonian brain is felt to cause symptoms of rigidity and bradykinesia. Blocking this over-activity with DBS can therefore help these symptoms. Unilateral and bilateral STN lesions have been performed but risk permanent dyskinesia or pseudobulbar palsy. The reversible effects of DBS made STN DBS more attractive than permanent lesioning. Unilateral STN stimulation mainly affects the contralateral hemibody. Benabid reported bilateral STN DBS results in improvement of the cardinal features of Parkinson’s disease: bradykinesia, rigidity and tremor. Patients also improved with attenuated motor fluctuations and reduced medication requirements. A double blind study done by Kumar et al. yielded similar results. They reported a 65% reduction in off-period Parkinsonism, 40% improvement in on-period parkinsonism, and an 85% reduction in levodopa induced dyskinesias. Our experience has shown that the benefit of STN DBS is that the patient will spend more time ‘on’ and less time ‘off’. Their ‘on’ functioning will be the same after surgery as before – they just spend more time ‘on’ than before. The ideal patient is therefore someone who had moments before surgery when they were functioning well. Those good ‘on’ times before surgery may have been ruined by dyskinesia or bad ‘off’ times. After STN DBS, the patient will have less time spent with dyskinesia or ‘off’. Their best ‘on’ time will be no better than before surgery – they will just spend more of the day ‘on’ and have less motor fluctuations. If a patient is having problems with balance or freezing of gait before surgery it is very important to understand if those problems occur during ‘on’ or ‘off’ times. Balance and freezing of gait occurring ONLY during ‘off’ times can be expected to improve with surgery. Balance and gait problems occurring during ‘on’ times will not improve after surgery. Most patients stay in hospital for two nights after DBS surgery (some prefer to go home after one day). The wounds must be kept dry for 10 days and then the stitches are removed (typically by the family doctor). Strenuous activity (e.g. lifting a heavy suitcase) should be avoided for 6 weeks. If there is a wound infection (pus in wound or gaping open of the wound edge) call us immediately! All wound infections can be cured with antibiotics but we want to stop the infection from reaching the device. The DBS electrode is just a piece of platinum sitting in the brain. It does nothing until the stimulation is turned on. The benefits of DBS depend on using the right amount of stimulation. Too little stimulation will not improve the PD symptoms enough. Too much stimulation will cause unwanted side-effects. Setting the stimulation requires experience and some trial and error. Patients come to the DBS Clinic 6 weeks after surgery to begin their stimulation trials. The DBS is turned on and patients assess the effects or several days and then return for adjustments. The time required to find just the right amount of stimulation varies between patients from just a few visits to several months of adjustments. In the DBS Clinic your DBS will be adjusted by one of the DBS Clinic nurses. The results will be review by the entire team. The DBS Clinic will also educate you about your DBS. You will learn how to turn it on and off and also how to check that the internal battery within the DBS is still working. Eventually the INS will run out of power and need to be replaced. This requires an operation to replace the INS. This operation is simple and usually done as an outpatient (you do not stay in hospital) with a local anesthetic (you are not asleep). The brain electrodes are not touched during this operation, only the pacemaker in the chest (INS) is switched. Following this operation the wound must be kept dry for 10 days and then the stitches removed. Our most common adverse experience with the DBS technology has been infection. Implanting a foreign object under the thin scalp of an elderly patient with borderline nutrition invites potential infection. We have not had a technical malfunction or disconnection but the batteries do wear out in 1.5-5 years depending on usage. Symptomatic hemorrhage at the electrode target site remains a possibility. Passing an electrode through the brain will cause a hemorrhage (bleeding or stroke) in approximately 1% of patients. Even a small stroke in an advanced PD patient can be devastating. There can be temporary side effects related to the stimulation spreading outside the target area of the brain and affective other areas of the brain. These side effects depend on what area of the brain is being stimulated and can include tingling, muscle tightness, double vision, hoarse speech, dyskinesia, and behavioural changes. It is very important for the patient to tell us about these side effects (and especially important for the family or friends to tell us about any behavioural changes) so we can immediately adjust the stimulation to eliminate those unwanted side effects. This is the main strength of the DBS system – these side effects can be eliminated by adjusting the stimulation. There is a possibility that the surgery will not be as effective as hoped. This can be due to suboptimal electrode placement, less than ideal patient selection, or inappropriate patient expectations. In an early survey of 50 patients, 10% were not happy with their results. Over the last ten years, we have improved in all these categories with the experience gained from approximately 400 procedures. In British Columbia, there has always been a close collaboration between the neurologists and neurosurgeons who treat patients with PD. Patients with symptoms refractory to medications have the potential to benefit from a variety of surgical procedures. In the future, there may be new treatments such as nerve cell transplantation, gene therapy, and growth factor infusion. Each new treatment will provide clinical benefits to our patients and an added understanding of Parkinson’s Disease.